Boasting beautiful design features, the new Triumph model is a double lounge spa comfortably fitting four persons, each with their own foot space! Massage fans are more than covered with this component; its Moto-Massage DX lounge providing a fantastic back massage in addition to foot therapy stemming from its two Precision™ jets for either foot, whilst users also have easy access to the auxiliary control panel. Furthermore, a vast array of jets populate the Triumph, with the Quartet™ jest system, and four each of the HydroStrean and powerful Precision calf jets occupying the entry-lounge alone. 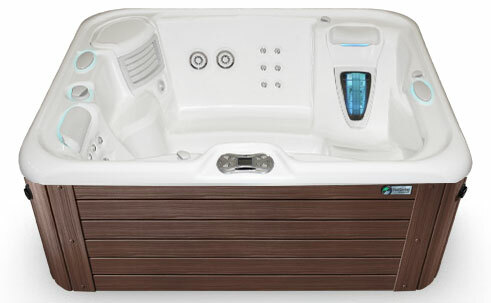 And different areas of the lengthy bench seat feature different jets also; one seat sporting a six JetCluster™ with the other boasting Soothing Seven™ jets, each allowing vigorous foot treatment through the presence of the unique FootStream™ jet. A cool down ledge for the user’s own convenience tops off this feature-laden spa.